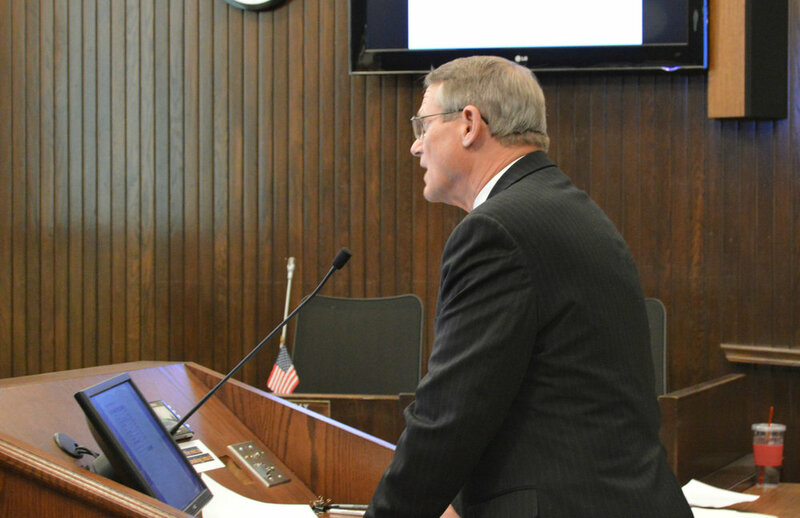 Interim City Manager Steve Rasmussen presented his proposed balanced City budget to Council members for further direction Monday night. The Bloomington City Council discussed four issues at its regular meeting on Monday, February 26, 2018, including solid waste collection, the city budget, the 20-year waste management plan, and video-gaming terminals. Aldermen voted 6-3 Monday night to enact a $4.00 monthly fee increase for the 65-gallon and 95-gallon carts starting May 1, 2018. There will be no change for the 35-gallon carts this year, but fees for all three cart sizes will be subject to a 3% continual annual increase beginning next year. The vote also means the City will move to free spring and fall bulk waste collection, with a $25 per-bucket fee for on-demand pickup. Brush collection services won’t change. Residents can still make unlimited free drop-offs at the 402 S. East Street facility, which will include extended hours. Interim City Manager Steve Rasmussen presented his proposal for a balanced City budget to council members for further direction. Aldermen shored up $1.1M of a projected $2.9M budget deficit for the upcoming fiscal year with their decision on the City’s solid waste services. City staff and council members will continue to look at additional ways to make up the budget gap, including increasing hundreds of City-wide service fees; a new business registration program and fee; and increasing parking fees. Council members have until April 30 to pass a budget. Council members unanimously adopted the Ecology Action Center’s "20-year Materials Recovery and Resource Management Plan." EAC Executive Director Michael Brown said recycling rates plateaued after the community passed its goal of 41% participation. Brown said the non-binding plan is a roadmap for the City to recover additional recyclable material to the benefit of the environment and the economy. Go Further: The McLean County-landfill is set to close later this year, potentially costing area governments additional fees to haul its trash out of the County. The Town of Normal approved the plan earlier this month following unanimous approval by the McLean County Board. Aldermen unanimously approved new video gaming licensing regulations and set a one-year moratorium, or temporary hold, on new video gaming terminals in Bloomington. City Attorney Jeff Jurgens said the new regulations closely mirror those already established in the Town of Normal but do not include a licensing fee. The Town of Normal charges $200 per terminal. As of 2017 there were 259 video gaming terminals operating within the City. Staff recommended the moratorium to allow for further research into the terminals’ impacts within the City and whether any additional regulations and fees might be necessary.